Energique® Liquefied Herbals are derived from the highest quality botanicals available from ethical, reliable sources throughout the world. The process used at our facility in Woodbine, lowa for botanical processing yields a superior product. Our herbals are prepared using the Spagyric extraction process: a slow, complex, multiphase extraction process that renders a more complete extraction of the essence of the herbs than any other process. This process results in a total liquefication of the herbs. The secrets of this 16th century processing method were nearly lost. By using this time-honored, slow and labor-intensive method, we are uniquely able to extract not only the tannins and essential oils, but also an abundance of mineral salts locked in the fibers of the botanicals. 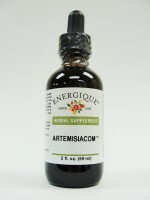 For ease of use, Energique® Liquefied Herbals have been formulated using different concentration levels to yield a common suggested usage level of 10-30 drops. Please consult your healthcare practitioner for your specflc usage level. For specific health issues and our suggestions: see this page. GENCOM: Fortifier for the blood, lymph, liver, and bowel. HYDRANGEACOM: Fortifier for the biliary tract and gallbladder. LICROCOM: a fortifier for the adrenal glands. LOMACOM: A topical herbal ointment that fortifies the skin. It has been used in cases of anti-viral, anti-fungal, anti-bacterial and anti-microbial situations. It also aids in the treatment of dry, cracked skin.